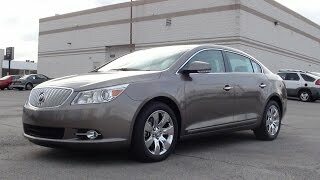 The 2012 Buick LaCrosse powerplant consists of a 2.4L Ecotec direct-injected four-cylinder engine paired with next-generation six-speed automatic transmission. Using the advanced power storage from its air-cooled lithium-ion battery, needed electrical boost can be utilized in various driving scenarios to optimize the engine and transmission. The LaCrosse delivers an estimated 36 mpg highway and 25 mpg city, thanks to the 115V lithium-ion battery and latest-generation 15-kW motor-generator unit. Buick LaCrosse with eAssist technology uses improved underbody aerodynamics for performance, as well as active control of front-end airflow, allowing the LaCrosse to hug the road for better vehicle stability and driving experience. Inside is a gracefully flowing design theme that surrounds the instrument and door panels. Attention to detail can be found throughout the interior, including the analog gauges, dark wood grain accents, and contrast stitching highlighting various sections of the instrument panel. Ice blue ambient bulbs are used to illuminate the cabin, giving the Buick subtle yet adequate interior lighting. Buick’s signature QuietTuning – an engineering process to reduce, block and absorb interior noise – provides a passenger environment that is distraction-free and comfortable. 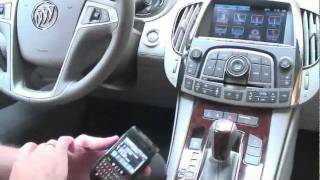 DETROIT– This summer, the 2012 Buick LaCrosse goes on sale, with the fuel-savingeAssist™system standard. Using a variety of technologies and exterior enhancements, it delivers an estimated 36 mpg on the highway and 25 mpg in the city – a 20-percent improvement in highway mileage and a 32-percent boost in city mileage over previous models. LaCrosse’s fuel economy rivals – or exceeds – that of small cars like the MINI Cooper (28 city/36 hwy with automatic transmission) and Toyota Corolla (26 city/34 hwy with 1.8L and automatic transmission), but does so in a full-size luxury package that comfortably seats five adults. MSRP is $29,960 before an $860 destination charge. The LaCrosse witheAssistnot only rivals the fuel economy of small cars, it trumps the efficiency of non-hybrid segment competitors and is on par with the more expensive hybrid models. The chart below compares LaCrosse with its main competitors’ 2011 EPA-rated fuel economy numbers. TheeAssistsystem captures up to 15kW of energy that would be normally lost during braking and uses it to recharge the lithium-ion battery. The system also shuts down fuel delivery in certain deceleration conditions, further improving fuel economy. While in fuel shut-off mode, the motor-generator unit continues spinning along with the engine to provide immediate and smooth take-off power when the driver presses on the accelerator. As the vehicle comes to a stop, the engine’s start-stop function is active when the motor-generator unit brings the engine to a smooth stop to position it properly for a smooth restart when the brake is released. A hill-assist system captures brake pressure to help keep the vehicle stationary wheneAssist’s start-stop function is activated on a moderate or steep grade, allowing the driver to accelerate more smoothly from a stop. 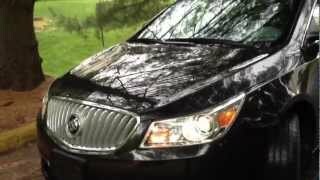 Buick LaCrosse witheAssisttechnology also features improved underbody aerodynamics and tires optimized for performance and fuel economy, as well as active control of front-end airflow that improves aerodynamics and engine warm-up. Electronically controlled shutters in the lower grille close at higher speeds to push more air over the vehicle, which increases aerodynamic efficiency to enhance fuel economy. All of these technologies increase theeAssistsystem’s regenerative braking capability, while also improving the vehicle’s efficiency while driving. An ECO gauge on the instrument panel continuously responds to driving behavior, allowing the driver to drive with maximum efficiency. In the pursuit of greater fuel efficiency, the LaCrosse witheAssistgives up none of the driving attributes, quietness or technology that have helped make this luxury sedan one of the fastest-selling in the segment. The driving experience is underpinned by a four-wheel independent suspension system, including a four-link rear suspension that uses isolating mounts to minimize noise and vibration. StabiliTrak electronic stability control system is standard, as is a variable-effort power steering system, four-wheel disc brakes with four-channel ABS, electronic brake force distribution and brake assist system. Inside is a flowing, uninterrupted design theme that wraps around the instrument and door panels. Attention to detail is evident throughout the interior, including the analog instrument cluster, chrome offset by dark woodgrain accents, and contrasting stitching on the instrument panel. Ice blue ambient lighting is used throughout the cabin, including the center console, instrument panel and door handle pockets. The contemporary atmosphere of the cabin is accented with available digital connectivity and personal technologies including in-dash navigation with a 40-gig hard drive (10 gigs reserved for music), Bluetooth, an auxiliary audio input and a USB port. Rear-seat passengers can enjoy an available power rear-window sunshade and a DVD entertainment system with two display screens integrated into the seatbacks. 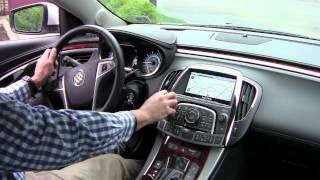 Later in the year, LaCrosse with eAssist will come with standard Buick IntelliLink, which uses Bluetooth or USB to connect the driver’s smartphone to a new eight-inch, high-resolution, full-color touch screen display radio. IntelliLink expands on Buick’s current Bluetooth and USB capabilities to allow smartphone control via voice activation and steering wheel-mounted controls. It also enables streaming stereo audio from the phone through services like PANDORA®Internet radio and Stitcher SmartRadio®. LaCrosse’s intelligent technologies also work to deliver a 360-degree field of vision behind the steering wheel, for a greater feeling of comfort, security and safety. Side Blind Zone Alert technology, which notifies the driver if a vehicle in adjacent lanes is traveling in the driver’s blind spot, is available, as is a rearview camera system that features a display integrated into the navigation system screen. The technologies available on LaCrosse enhance standard safety features including front-, side- and roof-mounted head-curtain air bags, and GM’s StabiliTrak stability- and traction-control system. The safety and security of OnStar is also included for the first year of ownership. LaCrosse witheAssistis manufactured at GM’s Fairfax Assembly facility in Kansas City, Kan.